Mo Borghei, as principal partner of ARCHI10, Inc. is responsible for the firm’s project design and management. Mo Borghei with over thirty years of practicing in the field of architecture, has gained extensive experience as project architect, designer, and project manager for large scale residential, commercial, professional office, retail, institutional, mixed use, recreational park, and governmental projects in California, Canada and Iran. As a senior project designer and associate close to ten years with The Nadel Partnership, Inc., an illustrious architectural firm in Los Angeles, Mo Borghei furthered his professional capabilities and talents with designing monumental architectural projects characterized by the firm’s award winning designs. He has also enjoyed working very closely with Rafii Architects in Vancouver, Canada as Senior Design Partner for many large-scale award winning monumental projects during the past twenty five years. Graduated from University of Tehran, Faculty of Fine Arts, School of Architecture and received the degree of Master of Architecture in 1974. Studied Urban Design at UCLA, School of Architecture and Urban Planning and received Master Degree in 1980, when awarded for the best Design Project of the year. Worked as a partner/designer with Orbis Architects on various building projects in Iran from 1969 to 1976. Worked as a designer/renderer on a vast variety of building projects in Los Angeles, California since 1980. Graduated with Master Degree in Architecture from Iran University of Science & Technology in 2001. 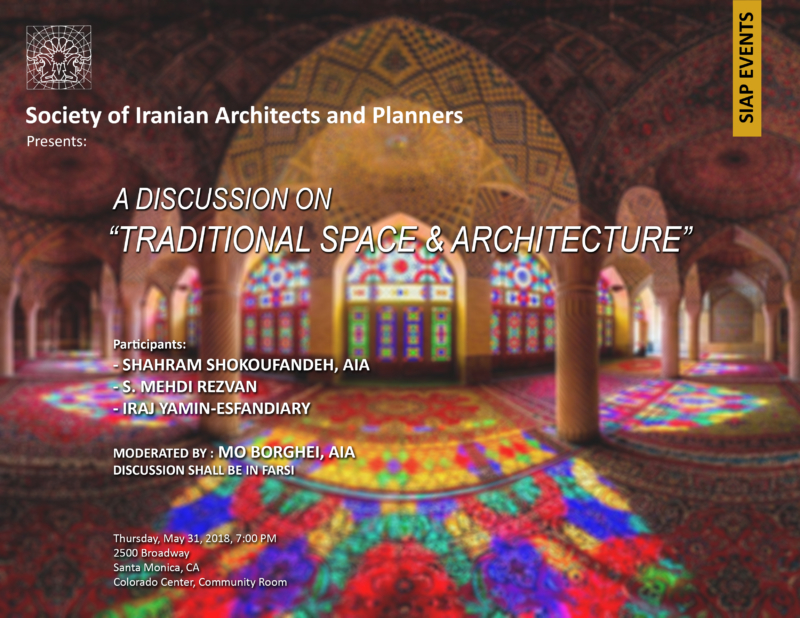 Taught architecture at Azad University of Tehran and Azad University of Shahriar. Worked with Naghsh E Jahan Pars consultant. Co-founder and managing director of NianMehr Consultants. Worked with Archi10 Inc and Labyrinth design studio. Currently with Bijan & Associates as Project Manager. Served as a member of Board of Directors of SIAP at 2016. Mr. Shokoufandeh began his career in his native Iran. After obtaining his architecture degree from the National University of Iran, he spent the 1970s designing properties that ranged from university campuses and laboratories to a wide range of residential and business properties. After moving to the United States during the early 1980s, he began a decade’s long career building a wide range of private properties, around the Greater Los Angeles area. Mr. Shokoufandeh believes that Architecture is defined by a conflicting relationship between abstraction and representation; an architectural design with apparent surface abstraction must possess a deep representational value. Abstraction is an aesthetic based on clarity of logic and representation is concerned with all historic, cultural, climatic, topographical, urban and living conditions. He also greatly emphasizes the importance of the relation of nature to Architecture, a concept which characterizes his work.